The mysteries, legends and wonders of the Balkans are yours to discover on this 25-day trip through nine incredible countries. 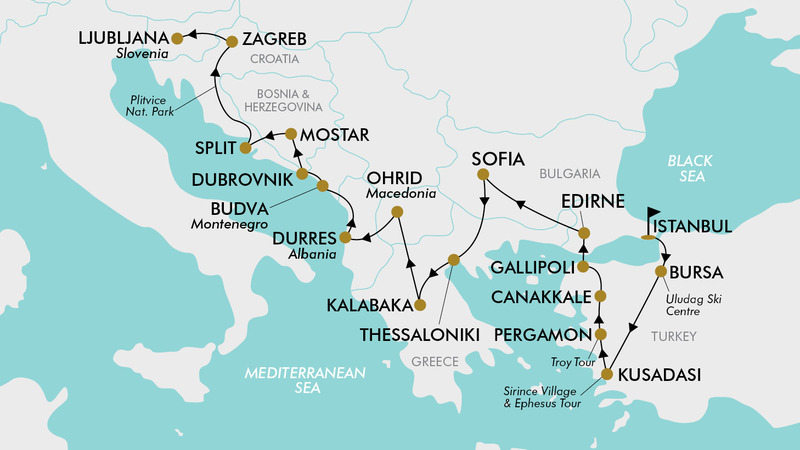 Travel through Albania, Bulgaria, Bosnia & Herzegovina, Croatia, Greece, Macedonia, Slovenia, Turkey and Montenegro and tick off the bucket list along the way as you immerse yourself in the highlights of each country. Begin your trip with a city tour in vibrant Istanbul; visit Ephesus, one of the most well-preserved ancient sites in the world; and take in the magnificent acropolis of Pergamon, along with the historic battlefields of Gallipoli. Enjoy a guided sightseeing tour of Sofia in Bulgaria; experience jaw-dropping Meteora, a complex of monasteries built atop towering rock pillars; and explore UNESCO-listed Vergina in Macedonia. Lap up the beautiful landscapes of Ohrid, Budva, Dubrovnik, Mostar, Split and Zagreb, and visit Ljubljana Castle and Lake Bled, plus so much more. With return flights with a premium airline, 22 nights 4-5 star hotel accommodation, 42 meals, English-speaking tour leader and guides and more, get ready to experience this beautiful part of Europe. Today depart from Sydney, Melbourne, *Brisbane, Adelaide or *Perth for Istanbul, Turkey! Fly with award winning premium airlines Emirates, Etihad Airways, Singapore Airlines or Qatar Airways (subject to availability). Upon arrival, you will be transferred to the hotel for check in. Enjoy the remainder of the day at leisure. After breakfast, depart to the Uludag Ski Center in Bursa. Located approximately 4 hours from Istanbul, Uludag is the most popular ski resort in Turkey and offers an abundance of attractions no matter the season. The mountain has different levels of runs to suit beginners as well as experienced adults. Equipment will be available for rent (not included) for those wishing to hit the slopes. Upon arrival, enjoy a short Bursa city tour, before checking into the hotel for the evening. After breakfast, depart to Sirince (approx. 5 hours). On the way, visit one of the famous leather production centres of the region, where you will have the opportunity to get a good factory rate. Upon arrival, have some free time for lunch (not included) before enjoying a tour of the village in Sirince. Sirince is a pretty village that mostly dates back to the 19th century with original white painted houses. Sirince also has a fantastic reputation for producing some of the best wines in Turkey - especially fruit wines. Visit a vineyard and learn how to make fruit wine with Turkish wine makers. Afterwards drive to Kusadasi for the night. After breakfast, visit Ephesus, one of the most well preserved ancient sites in the world. Here you will visit the Temple of Artemis, Curates street, famous Roman baths, Celsus Library and Grand theatre. After the tour, visit a place which continues to perform one of the oldest arts of Turkey; a carpet weaving centre. During the visit, you will have a chance to see the Turkish women who are working in the factory in action. Afterwards return to Kusadasi for the night. Today the tour departs to Pergamon (approx. 3 hours). Upon arrival, enjoy a tour of the magnificent acropolis of Pergamon - its impressive temples and library made it a cultural and political centre at the time. Pergamon is famous for its jewellery, stones and silver, and today you will see this firsthand with a stop at a jewellery centre. After lunch (not included), visit the famous archeological and mythological site of Troy, home of the Trojan Horse and Helen of Troy. Upon arrival, enjoy a tour of the archaeological site, before continuing Canakkale by 6:00pm for dinner. At approximately 7:30am, depart to Gallipoli to visit the historic battle fields. On the way, enjoy a stop for refreshments, before arriving at Gallipoli around midday. Upon arrival, break for lunch (not included), where you can relax before heading to the battle fields. Visit Kabatepe Museum, Ari Burnu Cemetery, Anzac Cove, Beach Cemetery, Shrapnel Valley and Plugge’s Plateau. Afterwards, drive towards to border to Edrine for the night. After breakfast, check out of the hotel and depart to Sofia, Bulgaria. Upon arrival, enjoy the rest of the day at leisure. You may like to explore Sofia city centre, shop in the local markets or enjoy the nightlife at the many bars or Casino. Today enjoy a guided sightseeing tour of the city center. Visit the Alexander Nevski Cathedral - one of the largest Eastern Orthodox cathedrals in Europe, as well as one of Sofia’s symbols and a primary tourist attraction. Continue to St. George Rotunda, St. Sophia Church, National Theatre, and the former Royal Palace, which now houses the National Revival Art Gallery and the Ethnographic Museum. Tonight, join an optional dinner (not included) at a traditional restaurant with folklore music and dances (available for purchase at checkout. Please note, a standard dinner is available for those who do not wish to join this optional activity). After breakfast, depart to Thessaloniki, a busy port town in the north of mainland Greece. Upon arrival, enjoy the remainder of the day at leisure. You might like to sample some traditional Greek food at a local Taverna. After breakfast, drive to Vergina, the first capital of the Kingdom of Macedonia, and a UNESCO world heritage site. The most important remains are the monumental palace, lavishly decorated with mosaics and painted stuccoes, and the burial ground with more than 300 tumuli, some of which date from the 11th century B.C. One of the royal tombs in the Great Tumulus is identified as that of Philip II, who conquered all the Greek cities, paving the way for his son Alexander and the expansion of the Hellenistic world. After lunch (not included), drive to Kalambaka, the gateway to Meteora. After Breakfast, depart on a half day tour of Meteora and Theopetra Cave. Meteora is a monumental rock formation that hosts one of the largest and most precipitously built complexes of Eastern Orthodox monasteries, built atop towering natural rock pillars. The Theopetra cave is an important archaeological site located in Meteora that was inhabited by humans approximately 130,000 years ago. After time for lunch (not included), drive to Ohrid, Macedonia where you will check in and enjoy dinner at the hotel. After breakfast, enjoy a half day city tour of Ohrid. Ohrid is a UNESCO recognized city, with beautiful landscapes, Byzantine frescoes and icons of traditional architecture. Visit the Hadzi Turgut Mosque, Old Bazaar, Zeynel Abidin Pasha Tekke, Krst Dazmija and more. The Hadzi Turget Mosque was built in 1466 by the Turkish Empire, and is believed to be the oldest in town. After free time for lunch (not included), depart to the resort city of Durres, Albania for the night. After breakfast, enjoy a Half Day City Tour in Durres. Visit the National Archaeological Museum, Roman Amphitheatre, Venetian tower, Town Hall Square and the Promenade, all with historical significance. Enjoy time at leisure for lunch (not included) before departing for Budva, Montenegro for the night. After breakfast, enjoy a Budva Town City Tour. Budva is the metropolis of Montenegrin tourism due to its sandy beaches, stunning landscapes and nightlife, however its historical monuments are just as exciting. Visit the historic Old Town, Ballerina and Mogren Beach, the Ancient Necropolis, Slovenska Plaza and more. After breakfast, enjoy the short scenic drive to the walled city of Dubrovnik for a city tour. See this UNESCO protected pearl of the Adriatic and its Cathedral, Rector’s Palace, Fransican Monastery, Clock Tower and Orlando’s Columns. Afterwards check in to your accommodation for the night. Today is yours to relax in the Old Town, swim in the crystal waters or perhaps take a day trip to the Elaphite Islands (not included). After breakfast travel to Mostar. Known for its iconic Stari Most (Old Bridge), a reconstructed medieval arched bridge, Mostar was developed in the 15th and 16th centuries as an Ottoman Frontier town, and during the Austro-Hungarian period in the 19th and 20th centuries. Enjoy a short scenic tour of the town before enjoying free time for lunch (not included) and shopping. The evening is at leisure. After breakfast check out hotel and drive north to the Bosnian Pyramids near Visoko. After a short visit and lunch (not included), continue to Split on Croatia’s Dalmatian Coast. Enjoy the morning at leisure before departing to Zagreb at midday. Enjoy a late afternoon city highlights tour, including the upper and lower town, the majestic Cathedral and Archbishops Palace. After breakfast, travel to Ljubljana. On the way stop at Plitvice National Park, a UNESCO World Heritage Site. Explore the 16 crystal-blue lakes cascading into 92 spectacular waterfalls. Walk on the wooden promenades providing magnificent views of the waters, where every turn leads to a breathtaking scenery and yet another waterfall. Surrounded by dense woods, Plitvice Lake is a natural phenomenon of rare and unique beauty. Afterwards continue to Ljubljana, where you will check in to your accommodation. After breakfast, enjoy a city highlights tour. Take a walk around the historic centre before visiting to the Ljubljana Castle, which has been standing atop a hill above the city for 900 years. The Castles Outlook Tower and ramparts offer some of the best views of the city, while the castle itself houses a museum exhibition on Slovenian history. Afterwards, enjoy a short scenic drive to Lake Bled in the Julian Alps. Here you will have time at leisure to explore on your own. In the evening, return to Ljubljana for the night. Today at the appropriate time you will be transferred to the airport for your return flight to Australia. Please note: some flights may arrive in Australia +1 days later. Visit Istanbul, Thessaloniki, Sofia, Ohrid, Durres, Budva, Mostar, Dubrovnik, Split, Zagreb, Ljubljana and more. Travel offer is valid for travel on selected dates until the 20th of October 2020. For solo travellers a mandatory single supplement of $1600 applies. - Istanbul, Turkey (Pre Tour): $280 per room (including breakfast). - Ljubljana, Slovenia (Post Tour): $320 per room (including breakfast). No discounts apply for third person travelling. Full price applies, subject to availability. Minimum group size 20, maximum group size 34 per vehicle. The best time to visit Greece begins in May, when the mean temperature is 21 °C degrees and rainfall is minimal and continues on through to October with average temperatures ranging from 21-29 °C. Days are sunny and clear! Bulgaria and Macedonia have a temperate-continental climate with moderate features which is characteristic for Central Europe. with hot summers, cold winters and very distinct seasons. Abundant snowfalls may occur throughout Bulgaria from December to mid-March, especially if you are in the mountainous areas. May is when temperatures really begin to climb and the summer season truly begins. The town and ports are filling up with tourists, restaurants and bars are alive, museums open and extend their hours and the weather triumphs it all by warming up considerably. Average temperatures reach a very pleasant high of around 21°C and reach a low of a very manageable 11°C. The weather in June is one of the warmest you’ll experience. Daily average temperatures in June are about 22°C, highs reaching up to 27°C and lows plummeting to about 16°C. Over the course of the month, the hours of sunshine remain pretty constant, with an average of about 15 hours per day. September is still very warm, with the average daily temperature ranging from 16-19°C, the highest still a lovely 24°C and the lowest temperature is only around 13°C. Is still fairly warm during October, but the temperature is noticeably lower than summertime. October’s average daily temperature is about 18°C over the course of the month, with highs decreasing from 22°C to 18°C and lows from 15°C to 12°C. Of course with the temperature being lower at night, it would be wise to pack a few items such as a light jacket just in case. 42 meals are included in the tour, for all other meals; lunches and dinners the tour leader (when available) will offer assistance with reservations, suggestions and directions to local restaurants. It is your responsibility to notify TripADeal of any dietary requests/requirements. Please note; we will do our best to meet your requests/requirements, however cannot guarantee that we will always be able to. Gratuities (tips) are not included in the tour price for services of the tour leader (when available) and driver throughout the tour. The recommended tip for the tour leader and driver is 25 Lira (approx. $10 AUD) per person per day in Turkey and €5 (approx. $8 AUD) per person per day in Europe, which will be collected whilst on tour. A tourist visa is a strict requirement if travelling on an Australian Passport. You will be able to start your eVisa application process once you receive your final travel documentation 6 weeks prior to departure.